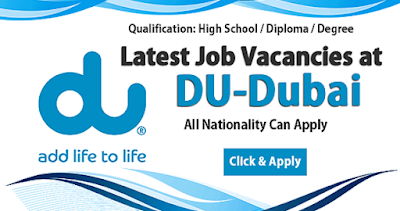 Latest DU Jobs In Dubai. DU is the re branded name of the Emirates Integrated Telecommunications Company, and is one of the United Arab Emirates' two main telecom operators with a strong reputation throughout the Middle East. DU offers mobile telephone services along with fixed line telephone services, digital TV services and internet across the UAE. As a highly prestigious company, DU is a popular firm to work for and offers jobs across a number of fields with many benefits thrown in. If you want to find out more about the latest DU jobs in Dubai, read on to find out about how to apply. DU offers its employees a number of excellent perks and benefits in an attempt to attract quality workers. As well as a competitive salary, there is also an outstanding rewards package which includes performance related pay, free mobile data in the UAE, and extra SIM card free of charge, family discounts for using the DU network, an annual airfare allowance, private health insurance for all staff their families, education support for employees' children between the ages of 2 and 18, flexible working hours, access to a gym, personal trainer and medical clinic, end of service benefits, entry into the UAE pension scheme, 30 days leave every year plus public holidays and local discounts with restaurants, stores and other services. If you are looking for the latest DU jobs in Dubai, you can find listings on the company's own website. Their dedicated careers portal is the first port of call for all of the current vacancies and here you can search by keyword or see all open positions so you can find the right post for you. There are also listings on other general job listing websites for Dubai including GulfTalent, Indeed and WeJobz. There are both full time and part time roles available to suit the needs of a wide range of people. There are many different skills required depending on the role being applied for. Many roles require a certain level of experience in a similar field, with a Bachelor's degree, industry specific or other relevant supporting qualifications being necessary in order to be considered. For many roles customer service skills are important, and good communication skills, both written and verbal, are also vital for many jobs in this industry. 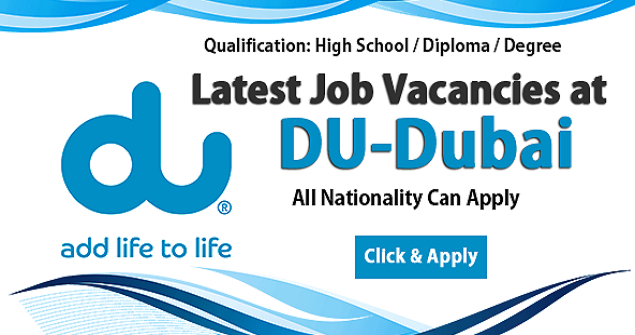 You can apply for the latest DU jobs in Dubai through the company's own website. Once you have spotted a job that you would like to apply for, you can simply click on the "apply now" button and complete your own personal information, upload your resume and supporting documentation and your application will then be passed on to the human resources team who will peruse your application to determine whether you are suitable for the post before possibly inviting you for interview.